Working in the entertainment industry got Zarina hooked to this fun-filled sector and she took on the leadership role while establishing UTV. Turning to philosophy and philanthropy after this stint, she found the purpose of bringing a meaning to other people’s lives and in turn, to hers. In a chat with SHEROES, she reveals her thoughts on leadership, Swades Foundation and life in general. How did UTV happen? Tell us about your life before Swades Foundation. I joined UTV when I was still studying in XIC (Xavier's Institute of Communications). In fact, UTV had not yet been formed. We were a small team that produced India’s first independent production called Mashoor Mahal, produced by Alyque Padamsee, directed by Ronnie Screwvala and the production manager was Deven Khote. I still remember my first day at work in the editing room - I went in at 7 am and I came home at 7 am - the next morning! My mother asked me to leave the job but I was hooked. A few months later UTV was formed. We had a blast creating 1000’s of hours of TV shows, some very successful, some not. But in 2006 I found my true calling in the media world, which was being in charge of Broadcasting. I remember the utter fun and joy of turning around the nascent Hungama TV which was at 26 GRP to Cartoon Networks’ prodigious 200+ GRP’s and in approximately 18 months, we were the Number One Kids Channel in India, beating highly successful global brands. The Walt Disney Company then acquired Hungama and this was the start of the long and excellent relationship we had with the Walt Disney Company. We then went on to create other leading channels including Bindass and UTV Action. We also created and launched Astro Ceria - the first local kid’s channels in Indonesia and Malaysia which also became #1 in their respective countries. It was a great journey and the teams were what made it happen! What has the journey been like as a woman leader? It’s not right to generalize but it would be fair to say that women tend to be collaborative, empathetic and persuasive. I think of women as having the power of water where perhaps many men could be competitive and assertive, more ‘rock-like’ if you will. And we all know who prevails between a rock and water - the water of course! Women are also more intuitive, so our understanding is born of a clear reading of a situation involving many different kinds of people and viewpoints. Empathy allows for a deeper understanding of people’s motives. So all in all, it might be a good idea to hear what the (sadly few) women at the table have to say. Women also are very resilient, able to take the ups and downs of life. We also tend to be more questioning of the ‘why’ rather than the ‘how’ - we tend to ask why we are doing something before stepping in to do it. This is actually the key question to ask yourself every now and then. Why am I doing what I am doing? Is it making me happy? Is it helping to make the world a better place? And then focus on the ‘how’. What are some of your learnings, having been a leader early on? Your #takecharge resolutions to be a better leader? Leadership is really about setting the best example for your team. You have to first be what you want them to be. All words are hollow if it’s not something you yourself practice. Whether you are a man or a woman, you need to bring your greatest strengths to everything you do and do it as fairly, efficiently and with as much joy and enthusiasm as you can. Your team will match you all the way! If they don’t then they don’t deserve to be there. If they do, then treasure them and let them outgrow you as fast as possible. Honestly, your team should be smarter than you are. Only then can your organisation and you grow stronger and better. Of course, you need a great deal of confidence for this. What triggered you to establish the Swades Foundation? I was stunned when I read it. I realised the only thing holding me back at UTV after we divested, was fear - the fear of letting go! The very same evening I told Ronnie, I needed to leave UTV (after 27 years) and do something new - but I had no idea what - I was quite terrified! While I was looking around, (I even did part of the fellows programme with the wonderful Shaheen Mistri of Teach for India), Ronnie came to me and said why not join SHARE (as Swades was then called) and then he said something that inspired me, “Let’s lift a million people out of poverty.” I was hooked! I joined Swades in July 2012. We planned, researched and travelled across the country meeting 100’s of philanthropists, NGOs and communities and finally by May 2013, we were ready to roll out our plans. How is Swades impacting the lives of the rural population? Our mission is to empower 1 million rural Indians every 5-6 years, creating a permanent, irreversible change for good. We believe in a holistic 360-degree development with a focus on four key verticals - Health, Education, Water & Sanitation, and Economic Development. This model empowers our communities with the capability of creating choices for themselves and their families, allowing them to transform their own lives and ensuring a permanent and irreversible change for good. We wanted to create a model for transformational change in rural India, which is replicable at scale. To empower our villages and communities to dream and to fulfil their dreams - this is real wealth. Our unique and highly innovative 360-degree model drew a lot of flak back then, but today it is seen as a great strength and the way to work. This model has a huge multiplier effect and speeds up the process of change. Today, we are a grassroots execution foundation with a wonderful team of over 350 full-time professionals, 20+ partners and 1000 trained community volunteers and we impact just under half a million people in 1900 villages across a geography of 3000 square kilometres. What are some of the struggles you’ve seen among women, through the work you do for Swades? The fact is that women and children suffer the most when the basics are missing. Take water for instance. Women spend 2-4 hours a day fetching water, sometimes they need to do it twice a day, not only for their families to cook and bath but also for their cattle. The lack of an individual household toilet compromises the women and older girls in ways we cannot even imagine. They go to the toilet in groups at 5 am before sunrise and do not go after that until around 11 pm! They suffer from diseases and fear for their safety and dignity. It is terrible! On the bright side, when women have the water and toilets that Swades provides, they immediately want to take on additional work. Many want to start small enterprises like sewing, vermin-culture, pickle and papad making etc. Money earned by women empowers a poor family in totally different ways than when men earn. Women spend differently. They spend on nutrition and education, while a man may decide to buy a two-wheeler. We are working hard to empower 1000’s of women (and men) to earn their own living. How are women contributing to your mission of Swades? Madhura Shinde’s husband met with a tragic accident which left him disabled and jobless. With a young daughter and a house to run, life for Madhura would have come to a standstill but she decided to take up our sewing programme and soon excelled at sewing bags. Today, her beautiful handmade bags are known far and wide and she earns a decent income to support her entire family, besides aiding her child’s education. Vasanti Waghmare, who is from a small adivasiwadi (tribal village), brought together 7 other women from her community and started a self-help group ‘Vankanya’. Under our guidance, they started manufacturing goat feed of different types and today they have a good customer base of 500+ farmers who buy feeds regularly from them. From doing odd labour jobs earlier to supporting their families with decent income now, their journey has been quite an inspiration for us and for many tribal women. What are the lessons you’ve learned from the rural people while working with them at the grassroots level? We’ve learnt to value the Earth and old methods of Agriculture, rather than the western methods, which actually could be adding to the problem. We’ve learnt how much of our traditional heritage and culture is being lost even in the villages and hope to work to celebrate and respect them. We’ve learnt that making mistakes is OK and our people love us despite them because our intentions are clean. We’ve learnt how amazed they are that someone who is not a relative of theirs, nor has religious nor political motives can work with them and for them. Inspired by us, it’s a joy to see them start to do their own seva for their communities. For instance, Seema More, who is our trained community health worker or Swades Mitra as we call them, came to the rescue of a disabled woman with a speech disorder and helped her with her untimely delivery, which happened en route to the hospital. Her baby is safe and sound today. Another Swades Mitra Ranjana Satave helped bring two school drop-outs, an 11-year-old boy and his 9-year-old sister, back into school by continuously motivating them and their parents. Today both the children enjoy school and excel in their studies too. Our scholarship recipient Shalaka Sheth stood 1st in her entire block in the 12th grade but her condition was so poor that she couldn’t afford to study further. After getting our scholarship, she not only got an admission in CS but also secured an all-India 20th rank in her first attempt! She also guided her junior Ronak Shah the following year for his CS entrance exams and he secured an all-India 22nd rank. Truly amazing! You have a keen interest in philosophy. What are some of the learnings that you apply in your everyday life? How has it helped you grow? Yes, the two loves of my life are Philosophy which I study and practise at New Acropolis, and Philanthropy which I study and practise with our Swades Foundation. They share a common word Philos – which is ‘Love’. One is the love of Wisdom, the other is the love of Humanity. Are they so different? Not at all. In fact, for me, they are two sides of a coin. One allows inner growth, the other is an expression of what you learn and become. A quick word about New Acropolis, it is a school of philosophy in the classical sense of learning timeless Universal truths and applying these to our lives. It is a living philosophy, a living wisdom, which actually nourishes us! 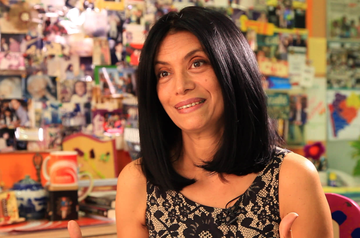 Zarina Screwvala is a founder of the Swades Foundation and works full time as its Managing Trustee/Director. The Swades Foundation operates with the single-minded focus of empowering rural India through holistic and sustainable growth. Zarina was also one of the Founder-Directors of UTV (now a part of the Walt Disney Company India), one of India's foremost media and entertainment conglomerates, where she led the creation and launch of leading broadcast brands.